The comprehensive online reference work for day-to-day life with more than 200 tips and information: discover it now in eight languages. What is the slowUp; where is the nearest hospital and how do you dispose of waste properly? Amriwelsch explains Amriswil to you, makes life easier and helps in day-to-day tasks. Look up useful information in German or translated into Albanian, English, Italian, Portuguese, Serbian, Spanish and Turkish. 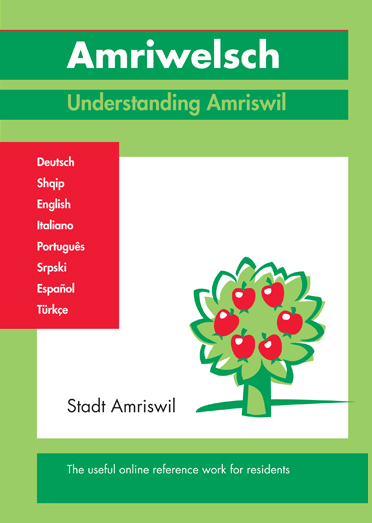 The resource contains more than 200 entries on life in Amriswil, tips for leisure activities, addresses and contacts. Foreigners also report on their experience and provide advice. With Amriwelsch, Amriswil office of integration provides all new residents with a practical tool for day-to-day tasks. Enjoy browsing from A for Aach to Z for Zihlschlacht.